In traditional nuclear thermal rocket and associated designs, the nuclear power is generated in some kind of “reactor” and used to heat a working fluid to build thrust. 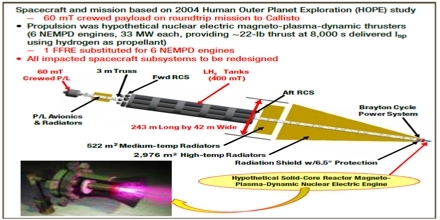 The fission fragment rocket is a rocket engine layout that directly harnesses hot nuclear fission products for thrust, in contrast to using a different fluid as working mass. The layout can, in concept, produce very higher specific impulses whilst still being well in the abilities of recent technologies.